🙂 Harsha Sir I trust u !! Arey Yaar main tere per padta hun..plz don’t call me Sir..
ok dost Harsha Sir Ji !! oh absolutely, fantastic job, and this “Kadey shabdo mein ninda” is not going to stop or take form of some action anytime soon. indeed condemn and keep condemning .. and keep messing up !! thats all they are doing. Thank you so very very much for your words ..motivates 🙂 to hang on. hahaha Yes indeed Vijay Ji I am a walking doodle myself 😀 yelling to all Indians lets do something to save our motherland ! Strikingly awesome doodle yet again! This is real sad that all these years we are being terrorized and have kept our mouths shut like puppets! Just one thing….referring to the whole of Pak is not correct as All the people there are not the same! Some of my greatest inspirations reside in Pak and it hurts when people blame each n everyone from Pak! Its the same at their end dear lady .. even they generalize and show us in poor light .. I have no personal grudge with a common man out there and it is very much understood dear lady that the ones who are promoting enmity are few and for them we have captured Kashmir .. for them we promote terror in their land .. for them we buy worldcups for them we are evil land ..
Plz do not misunderstand me because I am level headed Indian who has tolerance inculcated deep in blood .. they have fans of SRK in Pakistan .. that does not stop them from talking ill about India..
A country where mass killers are trained to kill Indians where they keep Osama Bin Laden and Dawood .. where they let loose Saeed Hafiz .. all we have done is been tolerant . 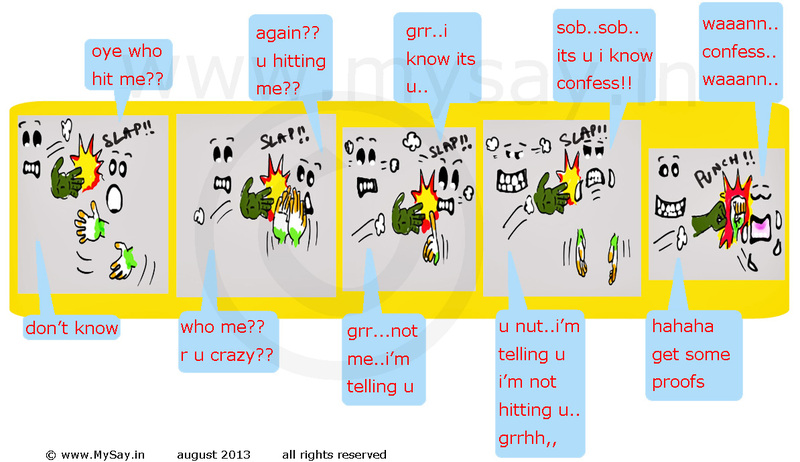 In fact thats what the doodle portrayed .. all we do is condemn !! Pakistan and Pakistanis will remain dearer to India ..
One might admire individuals of the nation .. nothing wrong in it .. my point is can we ask victims of bomblasts to be compassionate about Pakistan as a whole ???? Dear Lady, I am thankful to you .. for speaking this up .. many avoid .. confrontations .I praise you for that.Having said that .. I also wish to add .. those who have so much good to think about Pakistan , can they please ask them to send Dawood Sir to be taken care by the Indian Judiciary .. can they ask our loving neighbours to send Hafiz sir to be taken care by the Indian judiciary ? The loving neighbour has been promoting terror since they lost face to face fights with India .. is this a hidden fact ? but still all love gurus of India still feel Pakistan is sane !! Moreover , I wish people recall that when Bangladesh was their part they had suppressed and tortured .. Bangla speaking Muslims because they did not speak in Urdu and that they were considered low ..
who are we trying defend here ?? I dont say India is entirely sane ! But funniest part is in India you will still get a huge percentage of Indians who never consider Pakistan bad .. but in Pakistan there is very small percentage of people who thing neutral .. forget good about India !! Anyways .. its a free land where we live .. spiritually awakened as they say .. let us embrace our enemies till they perish us to death .. let us all hug them till they blast us and finish our national identity !! When Bomblasts kill our own only then we realize the loving neighbours are spreading violence.. to an extent that now they are being counter attacked in the same manner .. an evil creates another ..
No personal grudge .. but when it comes to their patriotism they do not think all this .. fan following and praises .. they mean their nation first !! Anyways .. I wanted to express myself … and my intention was not to show entire Pakistan in poor light .. I apologize if in any case it looks so ..
dear dear dear! Is THERE A MAN ALIVE WHO IS AS AWESOME AS YOU!!!! Thank you for this so long and so apt explanation Nit! Dear, lady in teens 🙂 we live in a country which teaches us to adjust and accept .Dont we ? In fact , be it Bangladesh or Pakistan … after all we are similar people. Hate is a business which is being propogated by few with vested interests ..call them politicians , bureaucrats and religious heads ..
Its the politicians who wanted lands divided .. a commoner even then was happy struggling for bread and even in English Raj ..
and that is the only fact .. Few leaders decided fates of land and thanks to their efforts to get separate lands for two faiths .. we are still fighting !! Pakistani commoner is as much like us .. who is bechara busy earning his meal .. who hates bombs anywhere and killings by any name.. Thank you for that link 🙂 Got to know so much more…..
Great stuff, dude. 🙂 Amazing. You said so much with few words. Grow up and act, don’t behave like kindergarten kids. thanks Saru !! its just getting repeated time and again!! So true. I don’t think even the so called foreign affairs minister can say it better then this doodle. sad but true. I think the entire government should do a crash course in Mahabharata, Art of War and if it is too intelletual for them how about some Harry Potter Books where even kids stand up for themself. Indeed .. its been 6 decades .. neither the Kashmir issue has been handled for good nor the relationship has gone any better thanks to the diplomatic behaviour of our nation.. I swear .. they need a read on Chahakya Neeti on foreign affairs !